The package that makes all of this possible is fittingly called docx-mailmerge. It is a mature package that can parse the MS Word docx file, find the merge fields and populate them with whatever values you need. The package also support some helper functions for populating tables and generating single files with multiple page breaks. The one comment I have about this package is that using the term “mailmerge” evokes a very simple use case - populating multiple documents with mailing addresses. I know that the standard Word approach is to call this process a mailmerge but this “mailmerge” can be a useful templating system that can be used for a lot more sophisticated solution than just populating names and addresses in a document. The package requires lxml which has platform specific binary installs. I recommend using conda to install lxml and the dependencies then using pip for the mailmerge package itself. I tested this on linux and Windows and seems to work fine on both platforms. That’s it. Before we show how to populate the Word fields, let’s walk through creating the Word document. In order for docx-mailmerge to work correctly, you need to create a standard Word document and define the appropriate merge fields. The examples below are for Word 2010. Other versions of Word should be similar. It actually took me a while to figure out this process but once you do it a couple of times, it is pretty simple. 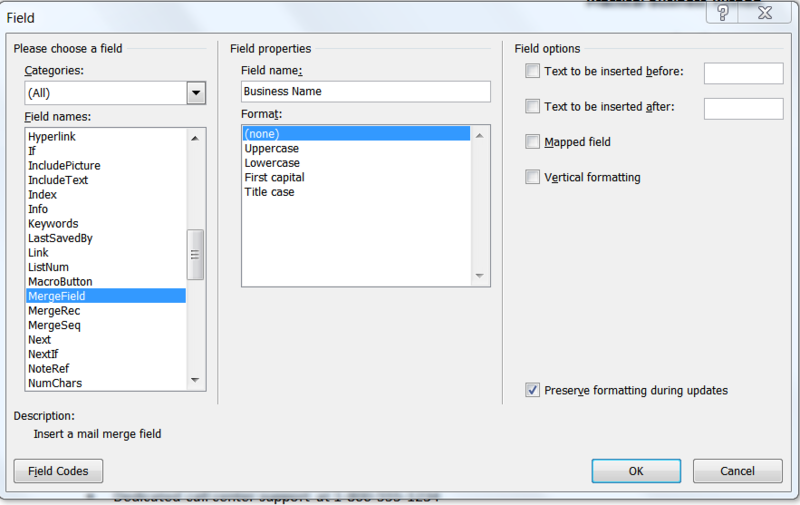 From the Field dialog box, select the “MergeField” option from the Field Names list. In the Field Name, enter the name you want for the field. In this case, we are using Business Name. Once you click ok, you should see something like this: <<Business Name>> in the Word document. You can go ahead and create the document with all the needed fields. This is a simple document but pretty much anything you can do in Word can be turned into a template and populated in this manner. If you would like to replicate the results onto multiple pages, there is a shortcut called merge_pages which will take a list of dictionaries of key,value pairs and create multiple pages in a single file. The output file is formatted and ready for printing or further editing. Another frequent need when generating templates is efficiently populating a table of values. 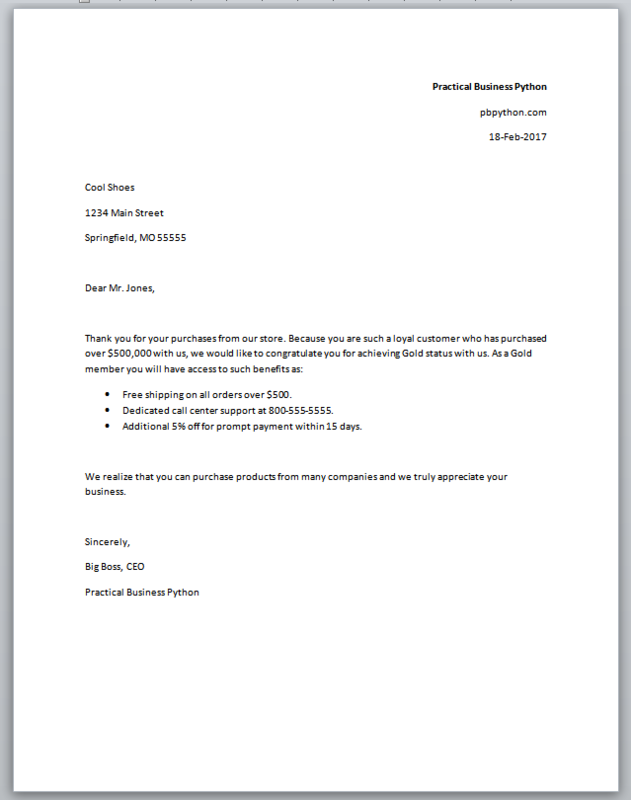 In our example, we could attach an exhibit to the letter that includes the customer’s purchase history. When completing the template, we do not know how many rows to include and the challenge of naming each field would get overwhelming very quickly. Using merge_rows makes table population much easier. Next, we need to define a list of dictionaries for each item in the table. In this example, we pass a dictionary to merge by passing the two ** . Python knows how to convert that into the key=value format that the function needs. The final step is to call merge_rows to build out the rows of the table. In case the process was a little confusing, here is a full example showing all of the various approaches presented in this article. In addition, the template files can be downloaded from the github repo. I am always happy to find python-based solutions that will help me get away from using MS Office automation. I am generally more proficient with python and feel that the solutions are more portable. The docx-mailmerge library is one of those simple but powerful tools that I am sure I will use on many occasions in the future.